June 25, 2007 : It’s go time again for Mikie and me. 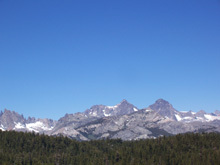 We were planning to leave this morning, heading for Mammoth Lakes on the eastern side of the Sierra. Mikie came over early yesterday to play with the boys next door, but they were gone. Since I was 95% ready to go, I suggested we finish getting ready and spend the night at my daughter’s place in Oakhurst. After calling to make sure they would be home, we had a quick lunch, finished loading and hooking up the trailer, and headed up the hill, about a 50 mile drive. They live on five acres in the country (off Road 620, across from the Bass Lake Road), with other homes around them but none very close. The road above their house ends with a big circle about a quarter mile walk from the house. There are driveways to unsold lots there, but no one has started building, so we parked the trailer there, arriving about 7 p.m.
Mikie immediately headed to the house to see Aunt Jenny and Uncle Rod, while I got the trailer into the position I wanted. 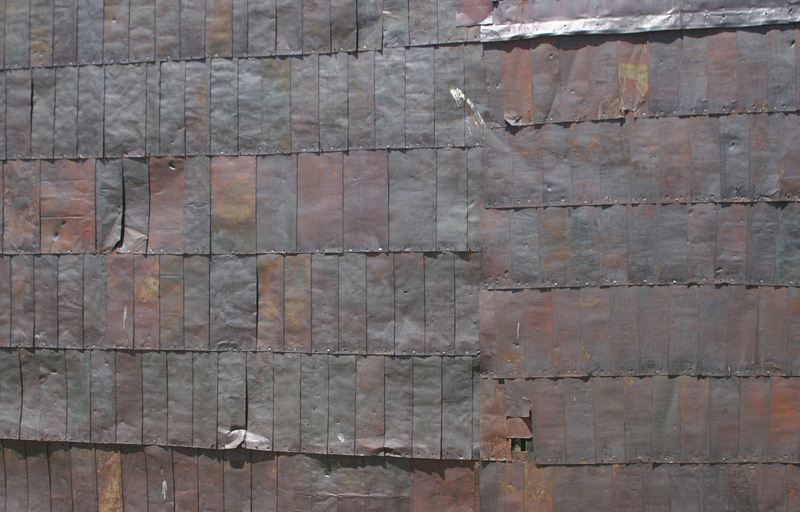 When Mikie got to where he could see their house, he noticed they were looking at something in their driveway. “What is it,” he asked. He immediately took off running, since he is fascinated by snakes. Apparently the snake was fascinated by Mikie, because it was still there when I arrived, five minutes behind him, although it had moved down into the grass. It was a gopher snake, about four feet long. Mike picked up a stick and lifted the snake part way up with it, and still the snake stayed. Finally he got up enough nerve to try to pick it up – and one touch was all took for this seemingly lethargic reptile to put on a burst of speed and disappear into a clump of poison oak. It was a good day for seeing animals – on the way in from the main road we had seen five small rabbits, and when I went back up to the trailer to get something, I saw a buck. We had a good time visiting Rod & Jen, and had a late barbecued chicken supper, then headed off for bed (in the trailer). When we left home I had noticed that the refrigerator warning light had come on, indicating a problem. It works on electric power when we're plugged in, and automatically switches to propane if there is no electricity. I reset it and we took off, but when we went to bed I noticed it was not working, and even after several resets, it would not stay on. I turned it off, and spent the first hour of what should have been sleep time worrying about it. We got an early start, about 7:30 a.m., and headed up highway 41 towards Yosemite. 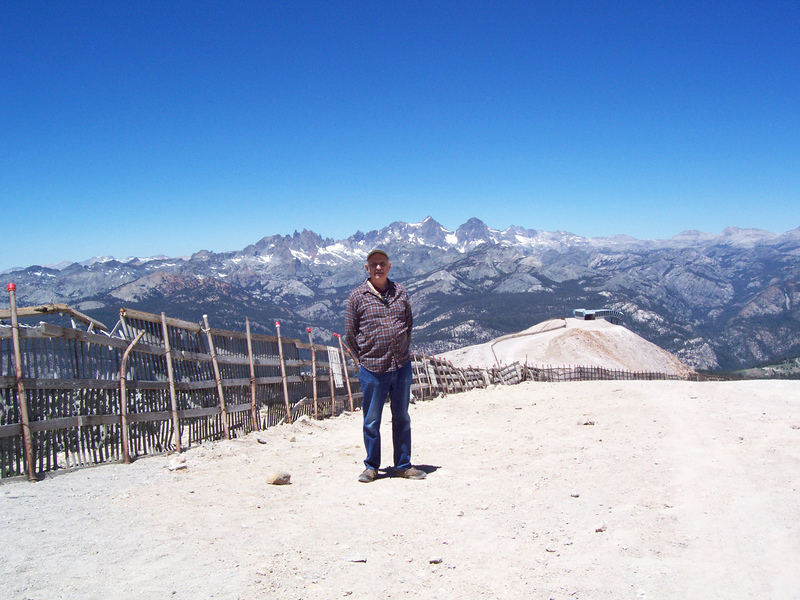 Our route took us into Yosemite Valley then out via the Tioga Pass Road that leaves the park at 9,000 feet. 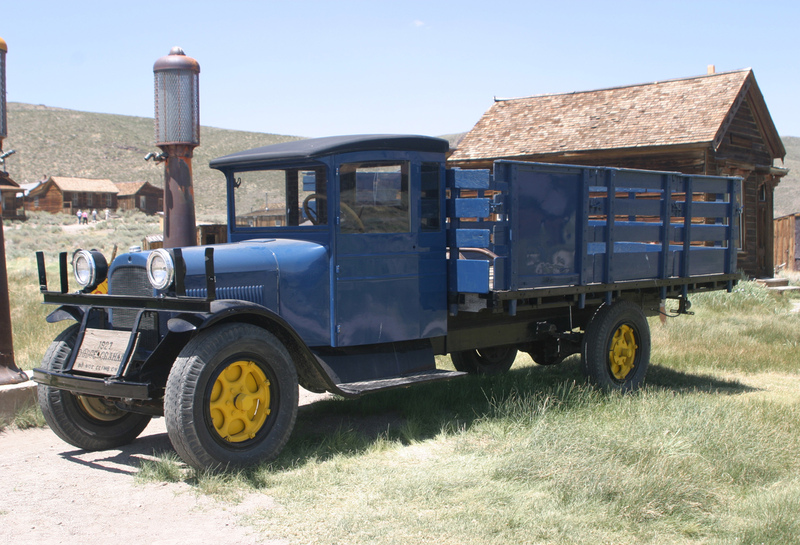 We dropped down 2,000 feet in ten miles to US 395, then headed south about 40 miles to Mammoth Lakes, three miles west of 395. It was fairly cool overnight in Oakhurst, and very cool up in the higher elevations of Yosemite . 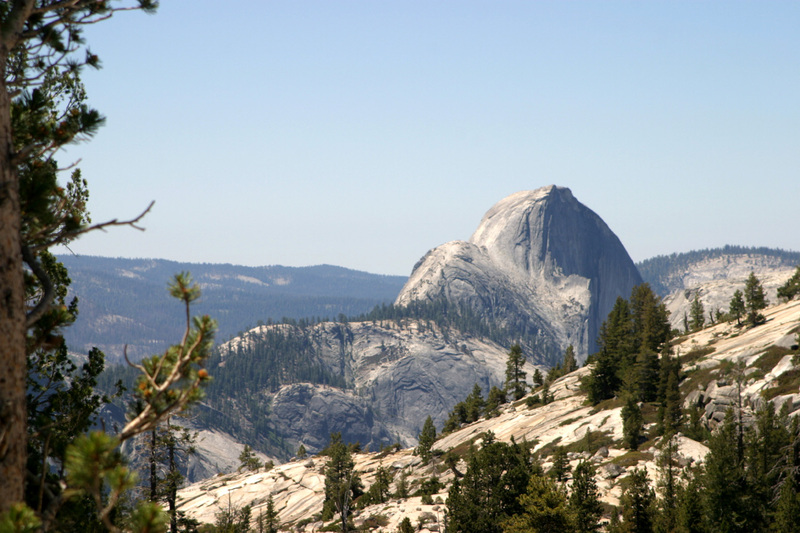 We stopped at Olmstead Point, where there is a good view of the eastern side of Half Dome, as well as Cloud’s Rest and the Tenaya Canyon. We ate lunch there and walked around; saw a couple of lizards, and Mikie managed to touch one. It was quite warm when we arrived at our camp site at about1:30. We got set up, and Mikie and I played catch, which he will do endlessly if there is someone to play with. He got a bat and whiffle ball at the RV park store, and I pitched to him several times. He also went swimming while I tried to check my Email. I was able to connect to their wireless network, but had a hard time connecting to the Internet. I was successful for a while, then got knocked off again. After that, I went to the visitor center across the street and got some information on some of the places we want to visit. Now we’ve finished supper, played a final game of catch, and are inside for the night at 8 p.m. It has been in the low 70s here in the daytime, and low 40s at night. 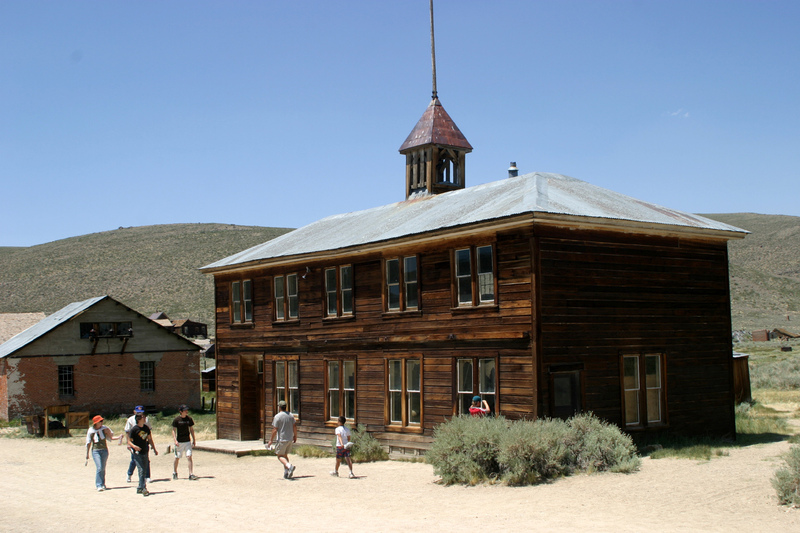 June 26: Today we went to Bodie, the infamous ghost town northeast of Lee Vining. 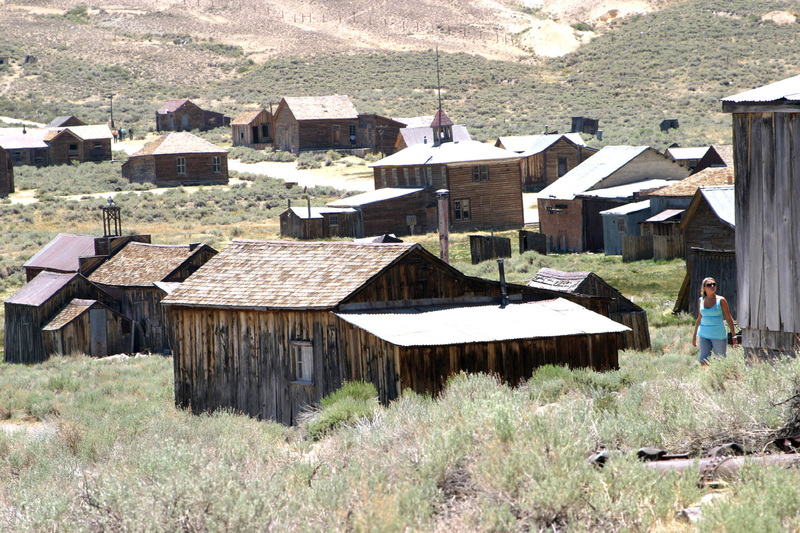 In the late 1800s it was a gold mining town with 10,000 people. 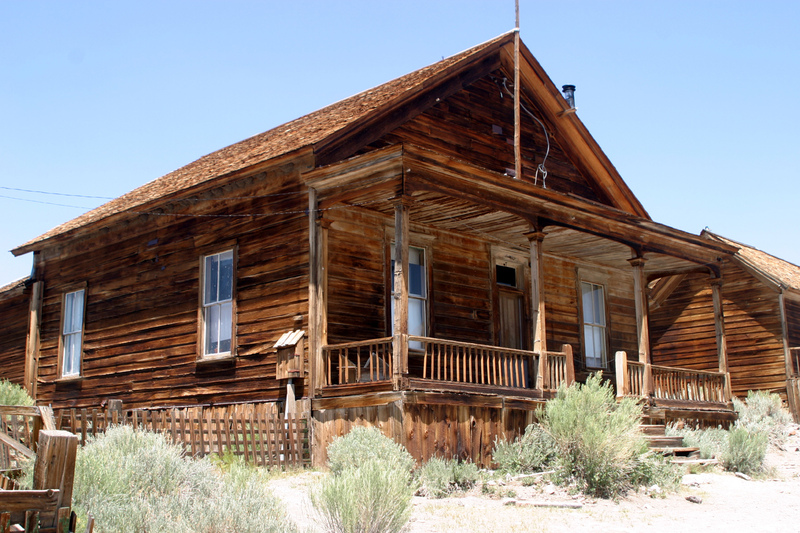 I think it was occupied till some time in the mid 20th century, but with just a handful of residents. 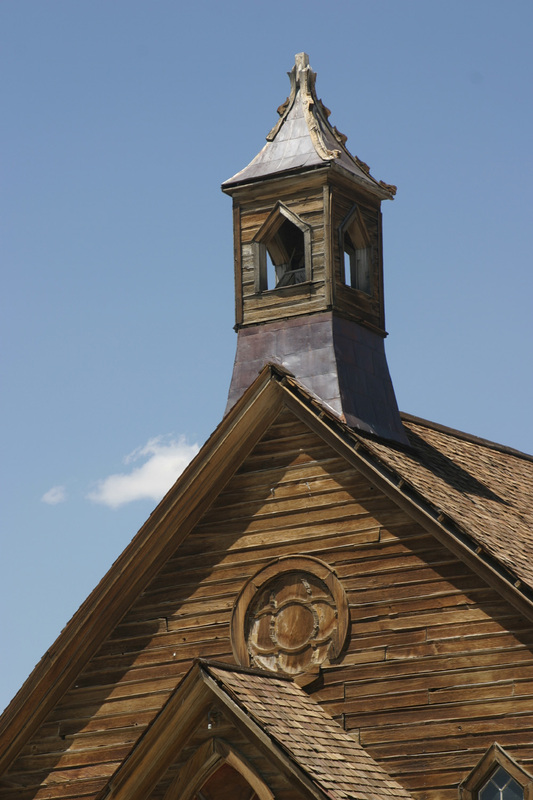 There are many old houses and a few commercial buildings that are still standing, all unpainted and weathered to a beautiful color. 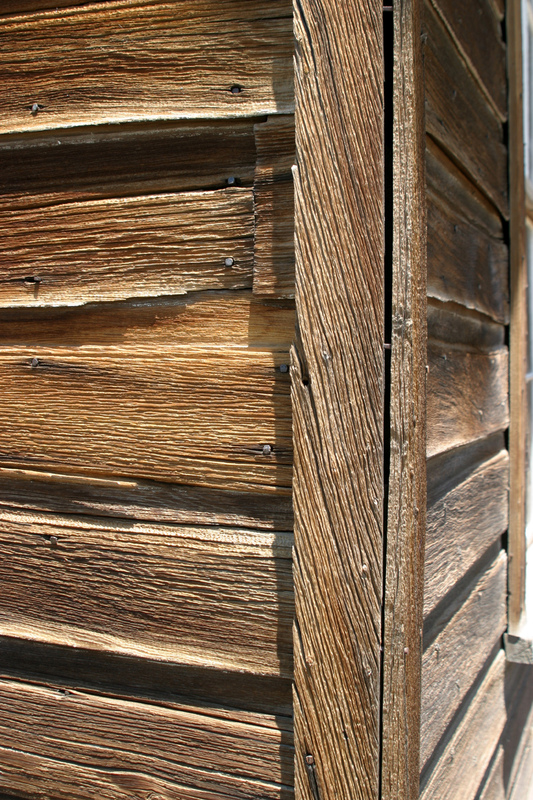 There is one house you can go into, and you can look in windows and see what was left behind in most of them. The old saloon had a slot machine and a roulette wheel, along with various bottles. There is also a museum where you can buy T-shirts, books and a few other items. 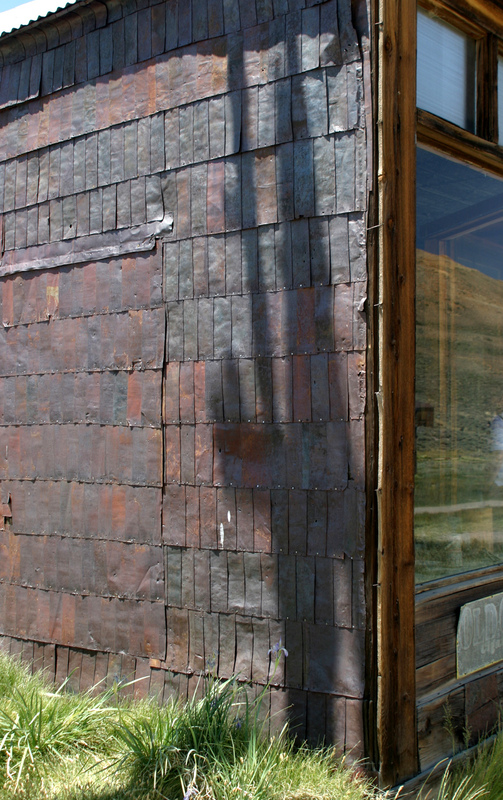 The town is located in a basin at 8,000 feet, with virtually no trees anywhere, and is unbearably cold in the winter (at least for me it would be; obviously the residents managed). 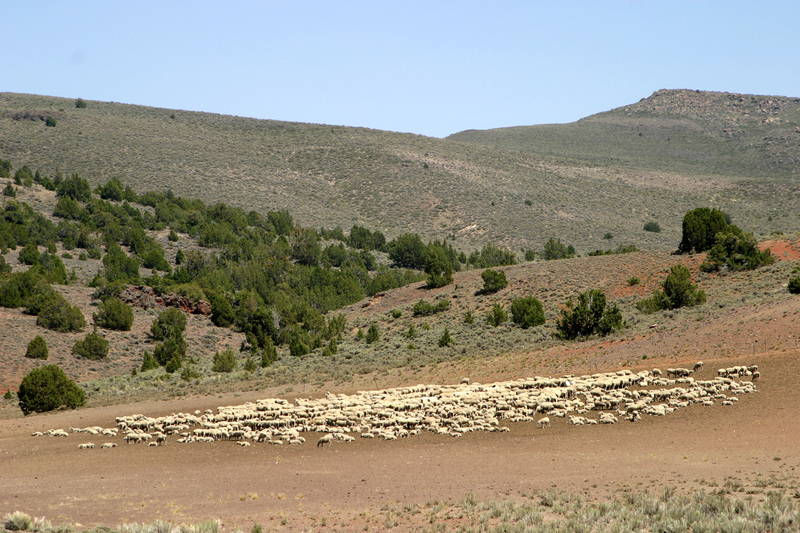 It is quite isolated, about 20 miles east of US 395, the last three miles being a rough dirt road. When we headed back south we stopped at Mono Lake to check out the wildlife – tiny brine shrimp that clump together and look like a mass of algae, brine flies that occupy the shoreline and first few feet of water by the millions and possibly billions, and seagulls that feed on both of them. 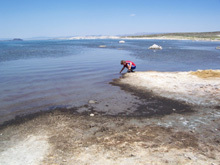 About 90% of California’s gulls come here to nest on the lake’s many small islands. Mikie was put off by the idea of millions of flies, but they are quite harmless, don’t bite, and almost never land on people. Soon he was wading past them to pick up some shrimp, which was what interested him most. They are very tiny, no more than 1/8 inch long. 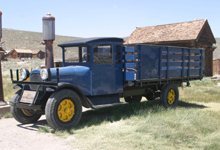 We stopped in Lee Vining to do some souvenir and grocery shopping, and headed back to camp. We’ve now had our evening bike ride, a shower, and dinner, and are ready for inside activities, again at about 8 p.m.
June 27: We’ve been having excellent weather, in the low 70s in the daytime, and high 40s last night. It got down to 47, but not till late in the night – at 3 a.m. it was about 56. Very comfortable for sleeping. 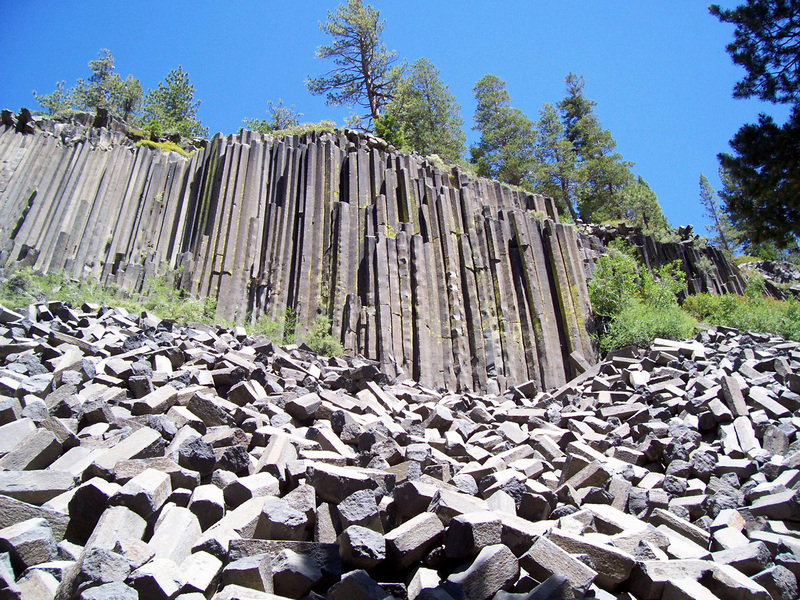 Today we went to Devil’s Postpile, which is down in the Middle Fork of the San Joaquin River, about 15 miles from town. It was my third visit there. The first time, I hiked in from the west, a two-day hike each way. The best thing about that hike, unlike every other backpacking trip I have taken, was that at the destination point there was a store selling cold beer. 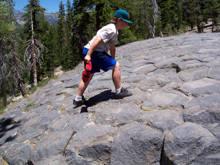 I went there again about twelve years ago with my older grandson and a friend of his. Visiting the area from Mammoth Lakes, you have to take a shuttle bus unless you are camping down there. Considering the narrow, winding road, I was just as glad to leave the driving to someone else. 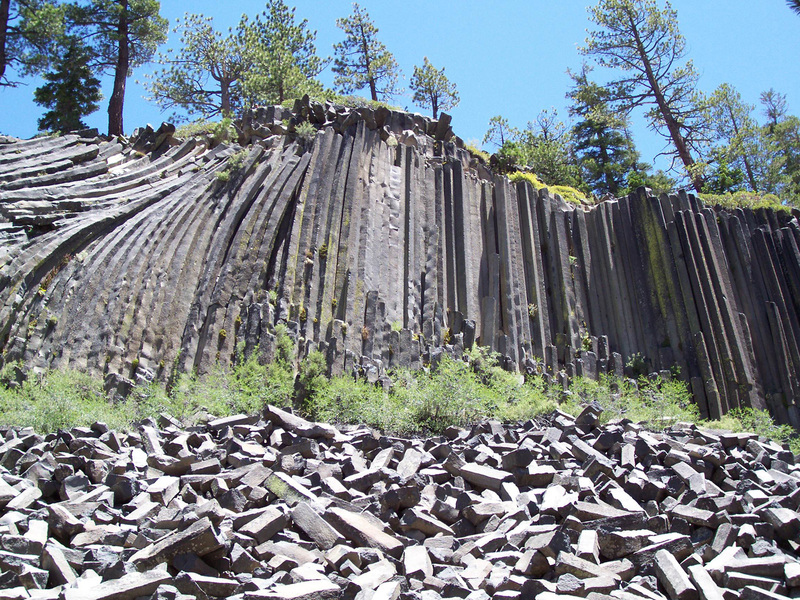 The Postpile itself is a volcanic basalt flow that formed cracks as it cooled. 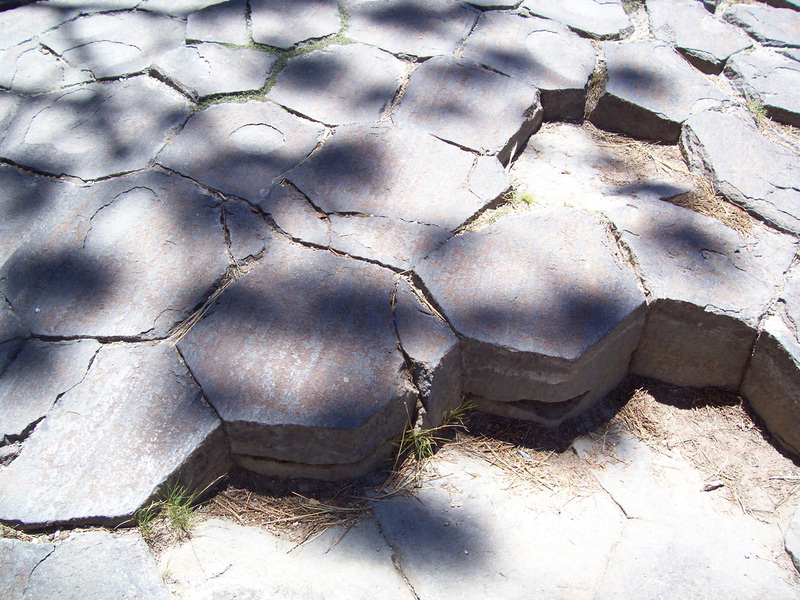 When each crack was about ten inches long, it branched off at a 120 degree angle, forming hexagons. 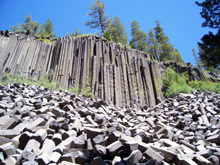 The face of the formation consists of vertical columns about 100 feet high. 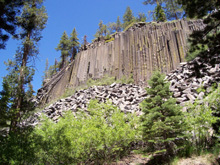 There is a large talus slope of broken posts between the trail and the bottom of the cliff. You can go up on top and walk across the rock and see the hexagonal divisions. When we had finished looking, we ate lunch at a picnic area, then walked on down to the trail to a place where we could catch the shuttle back. The ticket area also offers gondola rides, bike rentals, and a climbing wall, plus lots of other ways to get rid of your money. Mikie decided to try the wall, his first time for something like that. He was hesitant, but as I expected, he did very well. 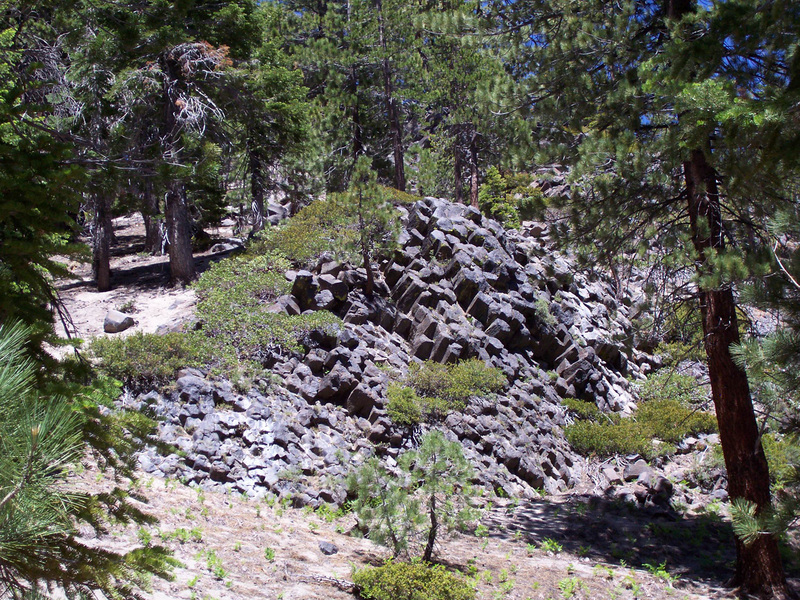 On our way back down to camp we stopped at an earthquake fracture, which is a fairly deep crevice, about 100 feet long or more, and ten to twenty feet wide. Mammoth is known as a center of many earthquakes, including one my mother felt in Mariposa about a month ago. Now at 5 p.m. we’re at the RV park swimming pool, where there is theoretically Internet access. Actually you can get on the park’s network, but they are having troubles of some kind and you can’t get on the Internet. The people in the office are unable to do anything about it, and don’t seem to care very much. June 29: Yesterday we didn’t go far but went to a lot of places. We started off with a stop at the Mammoth Lakes library, where I was able to connect to the Internet and clear some of my Email. We then drove up past the Mammoth ski resort, the jumping off point for many activities, including the shuttle to Devil’s Postpile. We went to Minarets Vista, where we could see the Minarets, a ridge of jagged peaks in the Ritter Range. 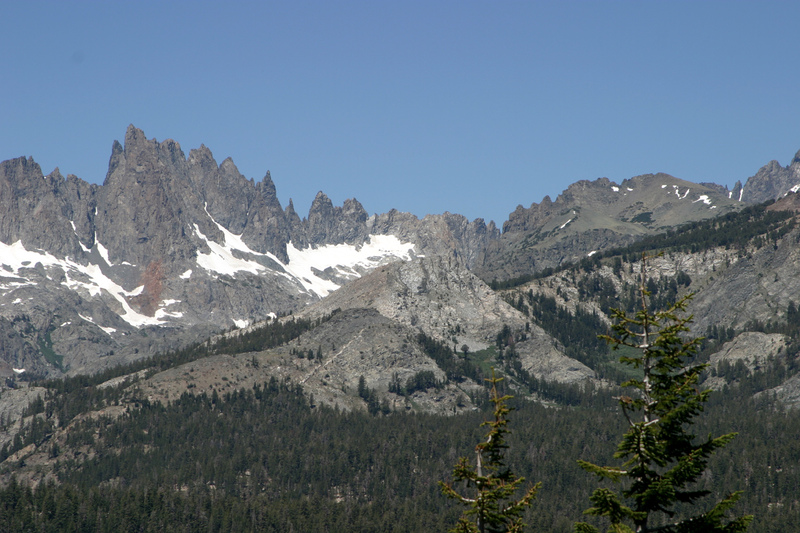 I’ve seen these peaks from the west and walking south of them on my first trip to the Postpile. They are also visible riding the shuttle bus, but the windows are closed, so it’s not suitable for photography. I was glad to finally have a chance to take a number of photos of this dramatic scene. 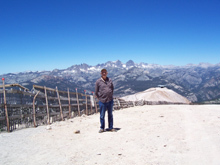 Coming back down to the headquarters of the ski area, we rode the gondola to the top of Mammoth Mountain. 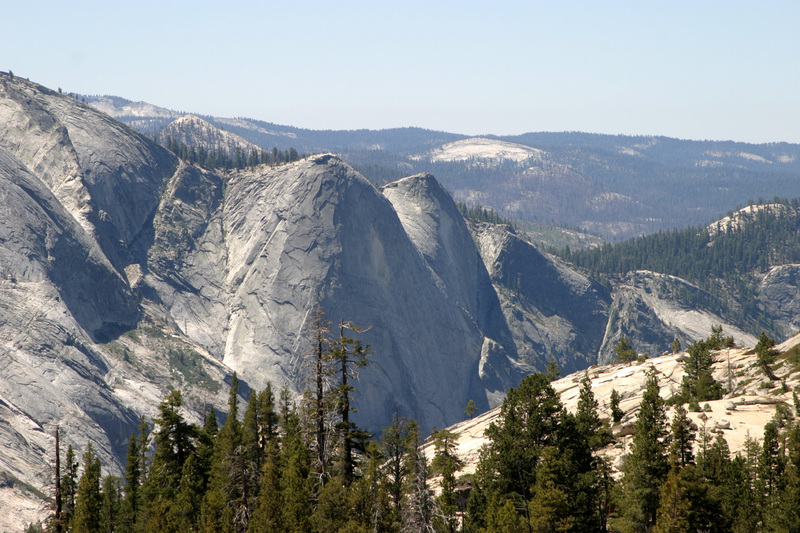 The mountain itself is not very scenic, being cleared for skiing, but there are views all around, including the Minarets, the San Joaquin drainage above North Fork which we are used to seeing from the west, and many high Sierra peaks. We ate lunch at the very expensive snack bar on top before heading back down. Mikie tried the climbing wall again, having a little trouble at the start, then getting into it once again. 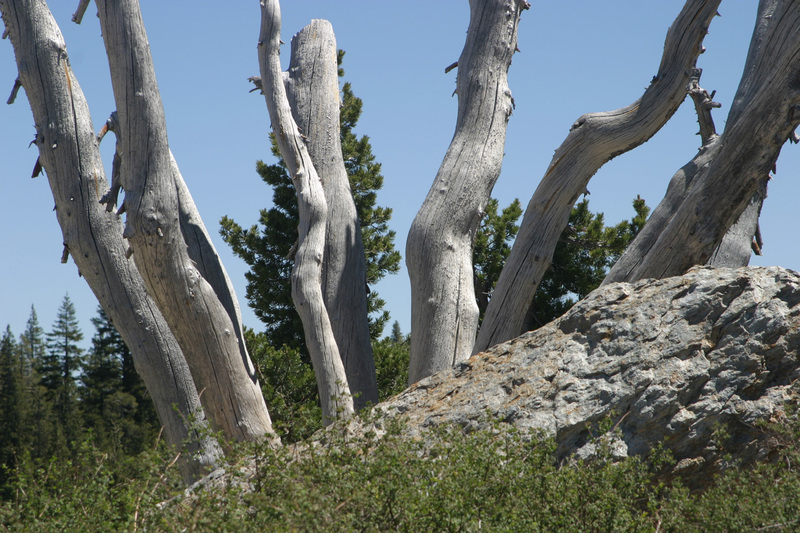 We then followed the Mammoth Lake Scenic Loop road six miles north and east out to US 395. It goes through open ponderosa forest ; nice, but nothing spectacular. 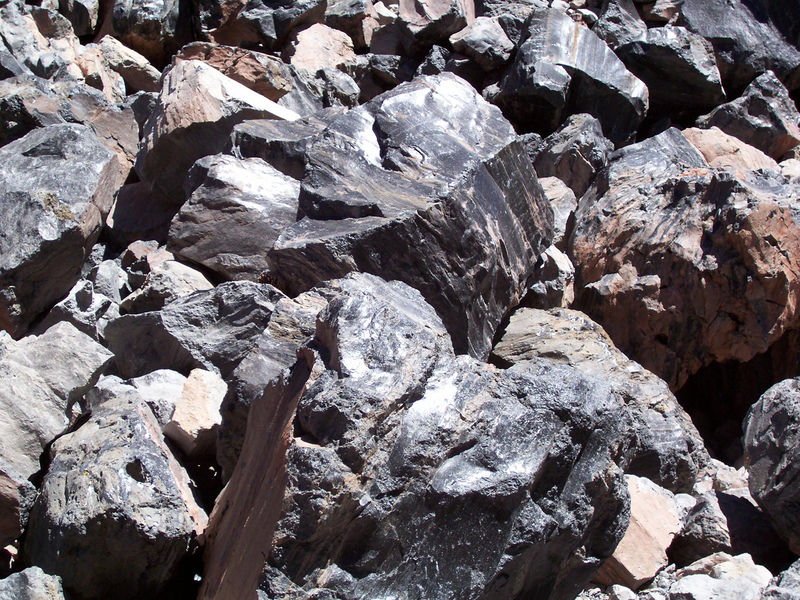 Next we drove up to Obsidian Dome, which is really a broken wall of obsidian, with lots of large and small pieces of this volcanic glass material forming a talus slope at the bottom. There are pieces as big as a Volkswagen. When I was a kid in Bootjack in rural Mariposa County, Bobby Butler and I collected many small pieces of obsidian and one or two arrow heads in an area back of where we lived that had been occupied by Indians. 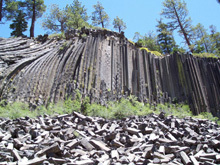 The obsidian here seemed to be less pure than what we found, although it was known back then that the western Sierra Indians traded for obsidian from those who lived on the eastern side. 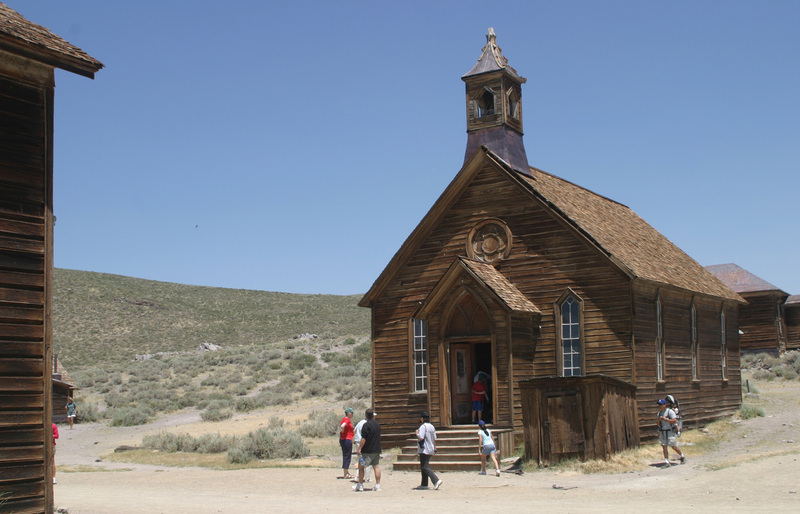 We left Mammoth Lakes behind this morning and headed south on 395 to Big Pine, a town of about 1,500. 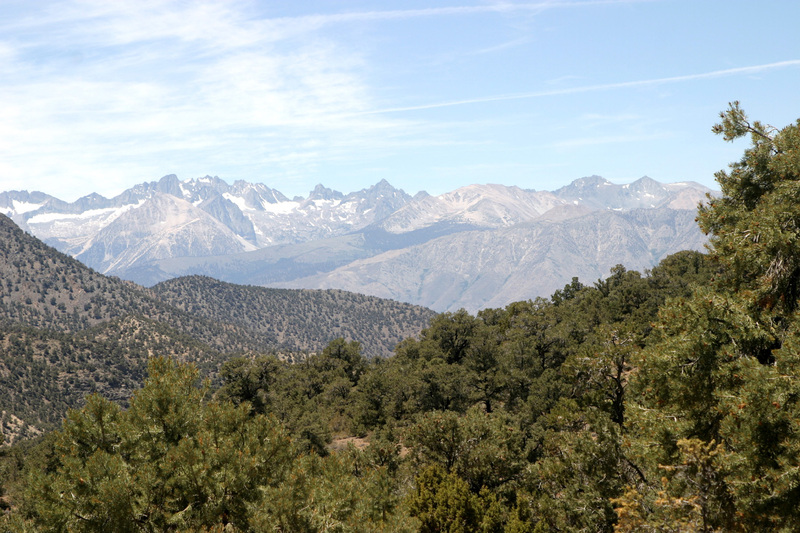 Along the way we were driving through the Owens Valley and sections of it known as Round Valley and Long Valley. We also dropped down from 9,000 feet to 4,000, with an increase in temperatures from the 70s to the 90s. 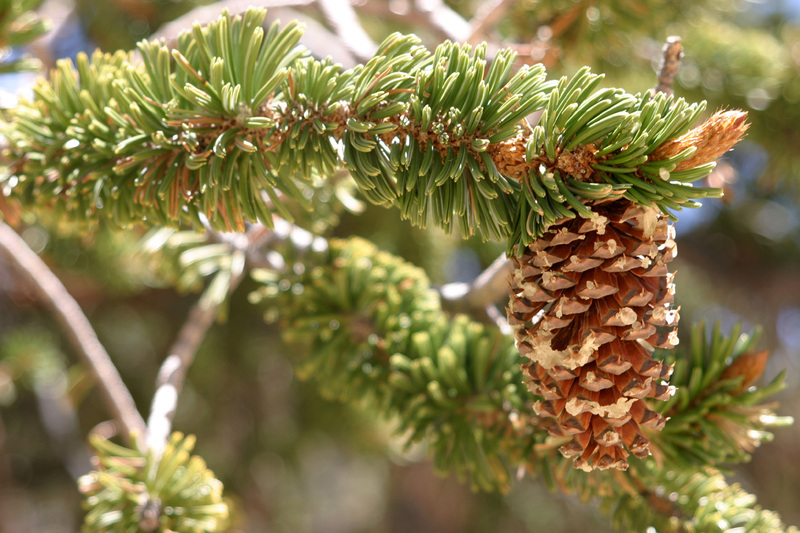 After setting up in a small RV park at the junction of state highway 168 and US 395, we went up 168 and turned north into the White Mountains to see the ancient Bristlecone Pines. The drive goes up from 4,000 to 10,000 feet, with a nice change of weather to the low 70s. 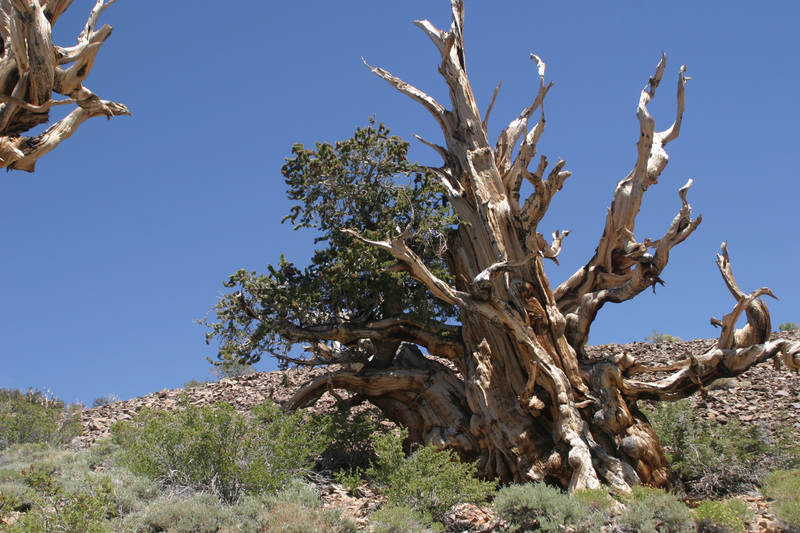 After stopping in the visitor center, we took a one-mile loop trail that goes through some of the old trees, which range up to 4,600 years in age, the oldest living things on earth. 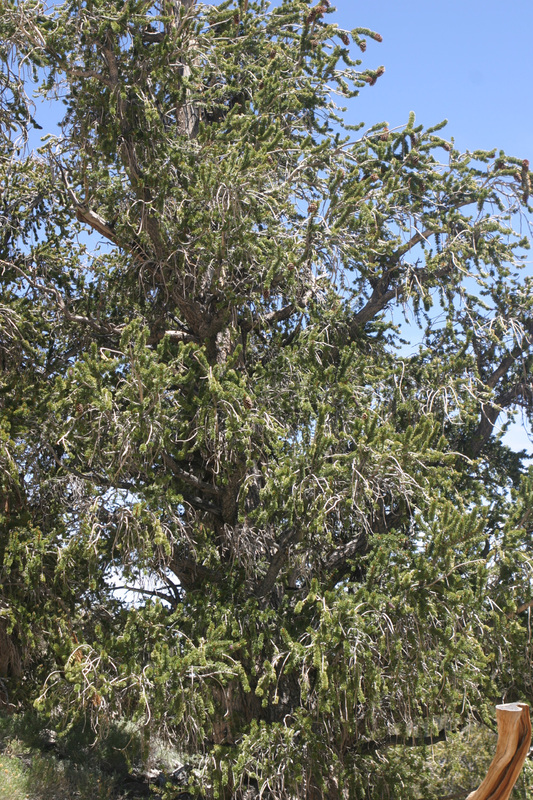 The larger trees are about 30 feet tall, with multiple trunks. 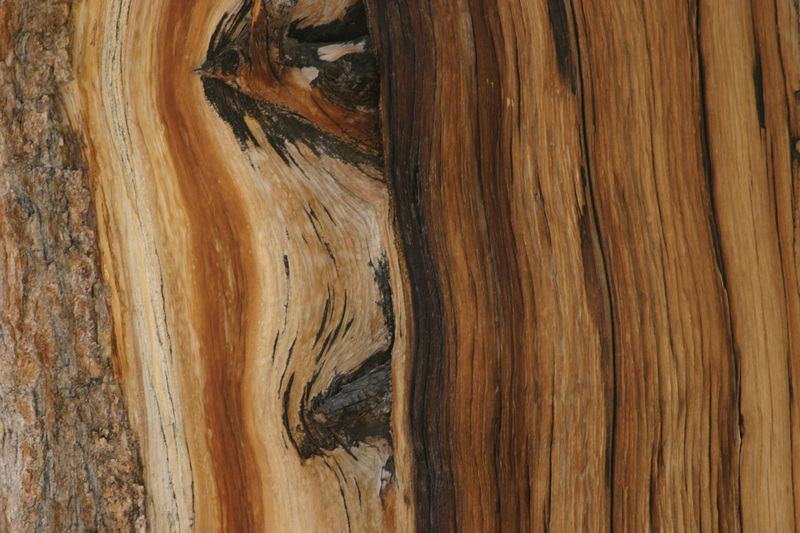 Where they have lost bark, they are beautifully weathered by the elements. 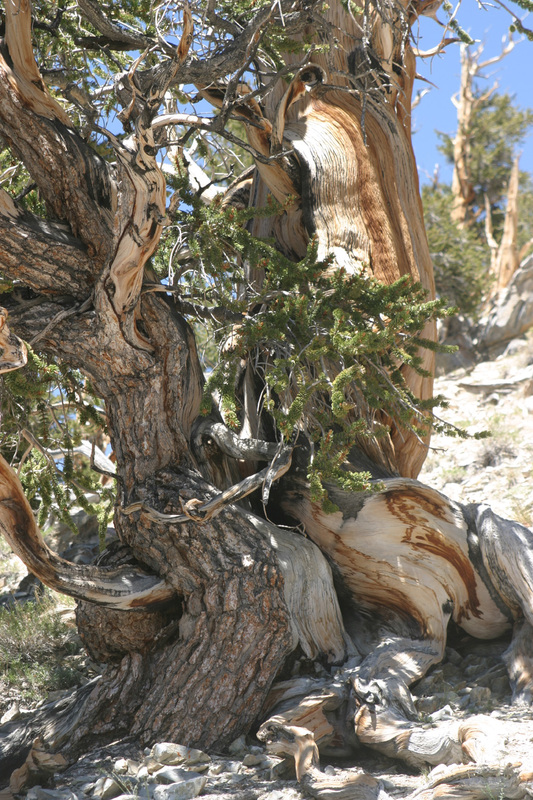 The most gnarled and seemingly damaged trees are actually the most healthy. 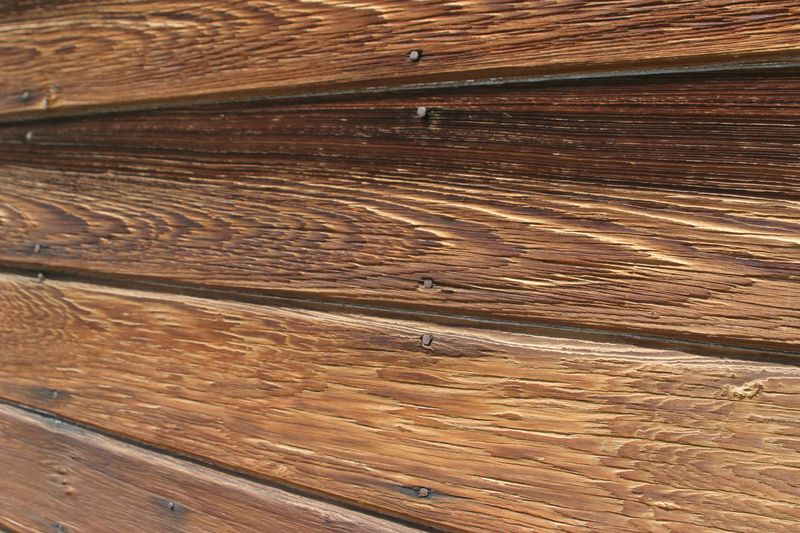 Exposure of the wood causes the tree to produce very dense, highly resinous wood that resists fire, insects and other enemies. 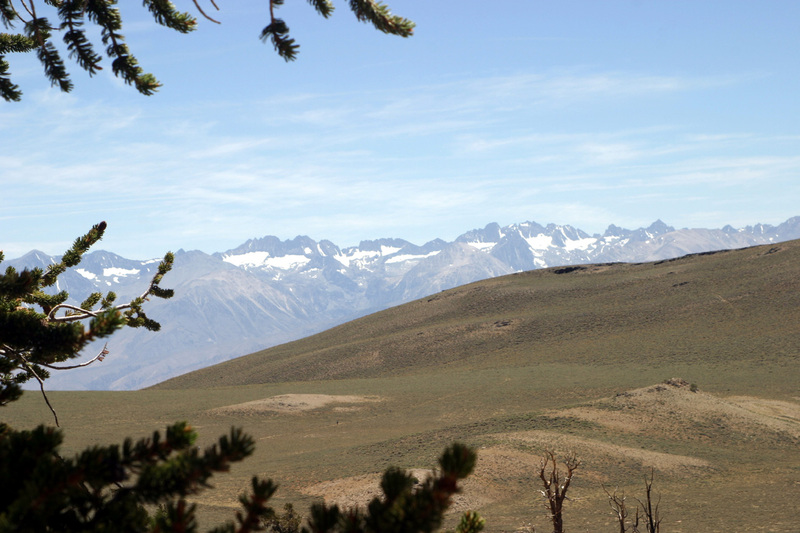 Along the trail there is a view across to some small glaciers on the eastern Sierra slope, the southernmost glaciers in the world. We got back to camp about 3:30, giving us time for a nap, some baseball, and working on this journal. In the evening we went into town for dinner (chicken and fries), played some more baseball, and are now ready to settle in for the night. 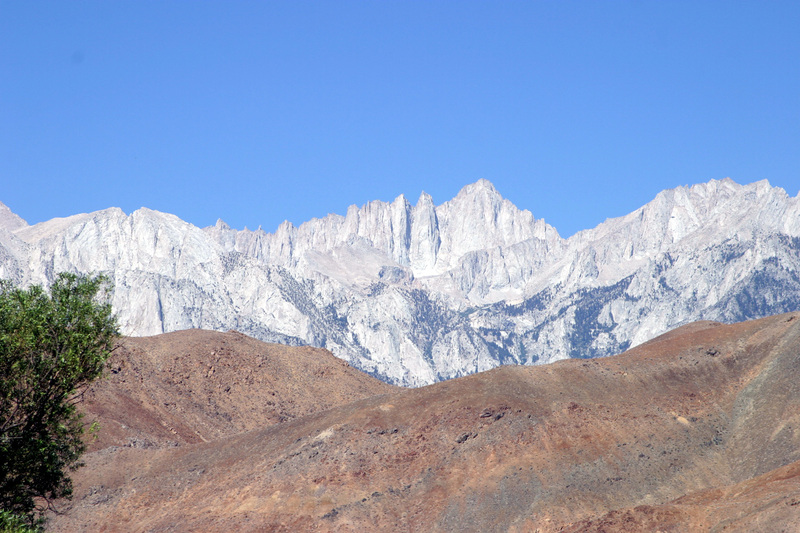 July 1: We left Big Pine a little after 9 a.m. yesterday (Saturday) morning, intending to take two days to get home, via Walker Pass and highway 178 over the Sierra through Lake Isabella. It was clear that Mikie was anxious to get home, and I did not have any burning desire to take an extra day, so I started calculating how long it would take to just go a slightly quicker route over Tehachapi Pass through Bakersfield. It looked like we could get home by around 6 p.m., so we made this our last day. US 395 jogs to the southeast, and we took California14, which goes southwest through Mojave and Lancaster toward Los Angeles, meeting California 58 near Mojave. From Mammoth Lakes south to the junction of 14 and 58 our route was one I had never traveled before, but once on 58, I was on very familiar territory, having gone over it at least once a year since I retired in 2002. We stopped in Tehachapi for gas and lunch, then continued over 58 and up California 99 to Fresno, arriving a little after 6 p.m. The weather was warm but not horrible, about 95 degrees. The horrible weather is coming at the end of the week, with 110 predicted. 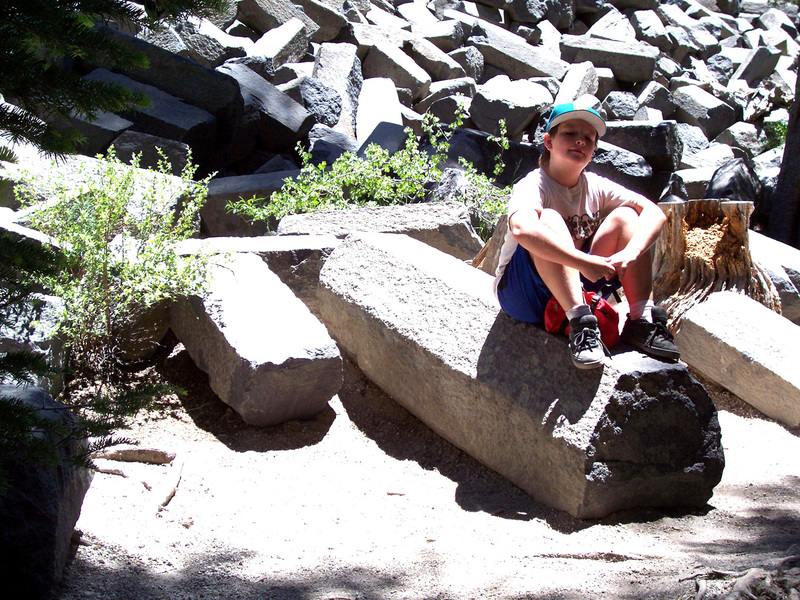 Maybe I’ll head back to Mammoth Lakes.